£12 Entry on the door or on-line as the event has now started. Just £10 in advance or £12 on the door. Entry is all inclusive - with a selection of wines, beers, soft drinks, tea, coffee, crisps & chocolates. Dance to a right good mix of up-beat music on one of the best sprung dance floors in Sussex. And wear what you like to this one. No dress code or fancy dress theme this month. 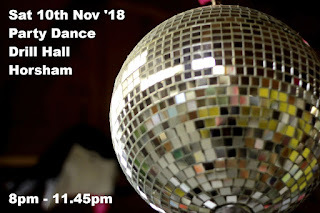 This is the longest running monthly Saturday dance in Sussex. And one of the most popular with dancers, both local and from further afield.